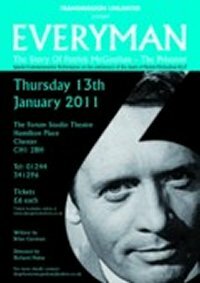 Thursday 13th January, the second anniversary of the sad passing of Patrick McGoohan, saw the first full performance of Brian Gorman's two-handed theatre play "Everyman", which tells the story of McGoohan's life up until he made "The Prisoner". A fair sized and appreciative crowd purchased tickets and attended the performance, which saw Gorman swap between portraying McGoohan and the Number Six character, with everyone very positive about what they had seen. A full review of the performance can be seen HERE, and The Unmutual Website will of course keep you up-to-date with any future performances of the play.